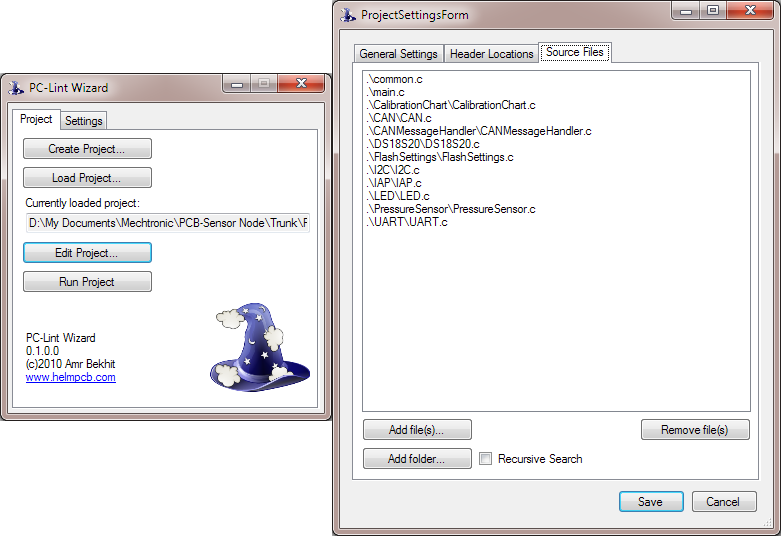 PC-Lint Wizard is a free and open-source GUI-based tool designed to facilitate setting up and maintaining Gimpel’s PC-Lint source code analysis tool for your projects. PC-Lint Wizard is written using the Microsoft .NET Framework and Visual Basic 2010. Easy to use GUI tool. Set up Lint for your project by dragging and dropping files and folders with recursive folder searching. Files and folders are saved as relative file paths, so that Lint can still be run if you change your project location or check it out of source control. PC-Lint Wizard can be downloaded from the project’s SourceForge page. Download PC-Lint Wizard v0.1.2 Setup File. Download PC-Lint Wizard v0.1.2 zipped (no install needed). If you have any problems, post them on the SourceForge PC-Lint Wizard Forums.